Editor's Note: The following was written by Santa to the readers of The North Pole Times. The staff of The North Pole Times joins Santa in wishing one and all a very Merry Christmas, and a Happy New Year! Ho ho ho! It's been one adventurous Christmas season this year! But we all managed to pull together and make it a great holiday for everyone? How has your Christmas been? I hope that it's filled with fellowship, friendship, and love. First, Ajax and Scooby had a fawn! It's a doe, meaning a a girl reindeer. She was born at the stroke of midnight, and Smitty, Timbo, and Waldo were there to welcome her into the world. Timbo says she's healthy and seems to be very happy. Timbo also told me that it was everyone's agreement to name the fawn...er...Phil. I've never had a reindeer named Phil before. It might take some getting used to. Speaking of Phil: He and Gizmo Elf have been holed up for some time in the toymaking room. Apparently, he has made several suggestions for improving the Appendapulator! Well, that makes sense. 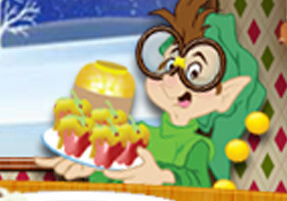 He's the great-grandson of Ha'penny Elf, who, of course, taught Gizmo everything he knew about inventing. It's been a pleasure having Ha'penny back at the North Pole! He's been catching up on old times with so many of the other Elves, as well as Mrs. Claus and me. I don't know how long he's planning on staying, though. He's sort of like Franny Fridays...always wants to be out exploring! Waldo has been experimenting with his 'famous' strawberry-and-mustard pudding recipe ever since he found out from Ha'penny that he was supposed to use cream instead of mustard in it. He thinks that maybe he might be able to eat it this new way. I certainly hope so...we're almost out of mustard. Holly wants to thank all the Santa Spotters for being on the lookout for our missing reindeer this year. It's great knowing that we have so many friends who want to help out. Remember: it's good to help out all the time! For instance: it's always helpful for you to take your plates to the sink without being asked. What other ways are there to be helpful every day? And finally, Dolores Flemspackle has been nothing but pleasant during her most recent visit. Turns out she can be very charming when she wants to be. And she's a good dancer! In fact, she and the Yeti have been 'cutting the rug' up here, and dance quite well together. In fact they are leaving tomorrow for Hollywood. Apparently, they're planning on auditioning for some TV show or another. Well, that's about it for this year. Mrs. Claus and I are getting ready to take our annual post-Christmas vacation. I think this year, we may just get our skis back out and go camping in the woods. I sure enjoyed the time I spent in the woods this year. I just have to convince the Mrs. to cash in the tickets to Aruba!